Eleusine indica (L. ) Gaertn. Culms: Prostrate to ascending or erect, slightly flattened, glabrous. Blades: Flat or folded, 2-8 inches long, less than 1/4 inch wide, mostly glabrous but sometimes with long hairs on upper surface near ligule; tips blunt or rounded. Sheaths: Loose, keeled, overlapping below, flattened, sparsely hairy or glabrous. Inflorescences: Panicles; branches 2-10, spike-like, 1.5 to 4 inches long, crowded at tip of culm, palmately whorled, sometimes 1 or 2 borne below main whorl. Spikelets: Numerous, crowded, 2-7-flowered; awns absent; florets sessile, closely overlapping in 2 rows along 1 side of rachis. Habitat: Waste areas, lawns, and fields, common in compacted soils that border trails and roads. Comments: Tufted. 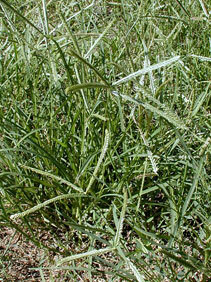 This naturalized grass is a common weed in tropical and subtropical areas.